Oil Change Service | Metro Transmission Inc.
A regular oil change service is one of the most cost effective and simple ways to cut down on expensive vehicle repairs. The oil in your car is as important as having enough water in your body, and if you deprive your vehicle of what it needs it will surly fail on you. At Metro Transmission Inc. we have over 30 years of experience in oil change services, and educating our clients on how to properly maintain their vehicles between visits. When do I need an Oil Change Service? The frequency of your oil change service depends completely on your vehicle manufacturer’s recommendations, the classification of oil you use, and the way you drive your vehicle. As the old saying goes, “it’s always better to be safe than sorry”, and with the health of your engine this could never be more true. If there is any doubt as to how close you are to needing a service, it’s best to schedule an appointment to bring your vehicle in. Our certified technicians are experienced with all makes and models, and will be able to give you a definitive oil change schedule based on the information mentioned above. We are committed to providing our clients with the best possible products and services, and have multiple options for our clients to choose from. With each oil change service at Metro Transmission Inc. we offer the following products and services to your package. 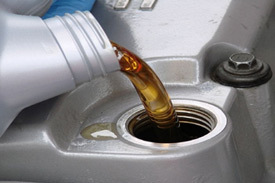 We try our best to make our oil change services are as convenient and affordable as possible for our clients. We cannot stress enough the importance of regular maintenance to your vehicle and we do all we can to help our clients avoid costly repairs down the road. HAVE YOUR CAR SERVICED BY THE BEST! Honesty, integrity, and the latest auto service technology in North County San Diego since 1983.